The newsletter is published monthly (except July and August). In 2008, the newsletter name was changed to "The Nova Scotia Post" in honour of the book of that name written by Dr. J. J. MacDonald, a long time member of the Club. All files are in Adobe® Acrobat® PDF format. You can either select the link to open or right click mouse key on link and choose "Save Target as..."
We have most back issues available in a PDF format and are creating a digital archive of all the newsletters since the 1960s when the current Newsletter was started. It is the intention to then create an index of the articles to front the archive and also offer it here. The project is somewhat stalled but all newsletters except from 1990 to 2002 have been scanned. Please watch this site for updates and availability of back issues and indices.. The newsletter has won several awards. 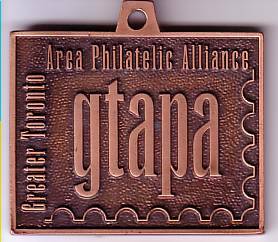 The most recent was a Silver-Bronze award at the C7NPLE, Toronto, October 2005. Nova Scotia Stamp Club, all rights reserved.